The Deadman has a few records that will live forever. Pro Wrestling is a sport where the result of the contest is predetermined. As a result, records are not the safest things in wrestling. More often than not a promoter would make a conscious effort to have one of his wrestlers break a long standing record just to elevate him in the public eye. But even then there are some records in wrestling that will surely never be broken or replicated. The changing times and taste of the fans make sure that some feats will stand the test of time. And even though the old saying goes, "All records are made to be broken." Not all records are created equal. So here is a look at 5 WWE records that will never be broken. 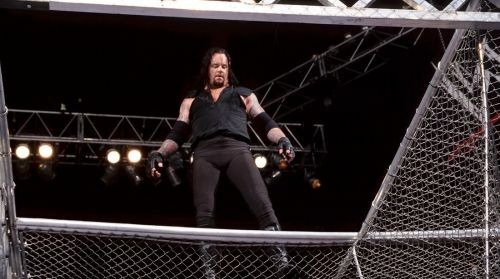 The Deadman has entered 'The Devil's Playground' on 14 occasions. In an era where bleeding has become as rare in wrestling as a Curt Hawkins victory, it is very hard to replicate the magic of the Hell In A Cell matches in the Attitude Era. While Hell In A Cell matches used to mark the end of feuds back then, today it has become just another gimmick match to advance a storyline. Hell In A Cell matches are becoming rarer with every passing year and it is because WWE has started to burn out of ways to keep the concept entertaining without the use of the brutality that made the match so famous in the first place. As a result, it is hard to see anybody even coming near The Undertaker's record of 14 appearances inside the Hell in a Cell structure. The nearest man to him is Triple H on 9, and 'The Game' will surely not participate in 5 more Hell In A Cell matches. Thus, this is a record that is unlikely to ever be broken. 10 WWE records no one's broken till date... And probably no one will, ever!